Independent home entertainment label Camp Motion Pictures confirmed the July 3, 2018 re-release of its popular H.P. Lovecraft tribute CALL GIRL OF CTHULHU following a series of successful theatrical and micro-cinema screenings in NYC, Philadelphia, Baltimore, Austin, Tucson, and Washington D.C. The Blu-ray / DVD combo re-issue loaded with extras features new art inspired by 1970s / 80s horror paperbacks and VHS as well as a new, lower SRP of $24.99 / Alternative Cinema Direct price of $19.99. 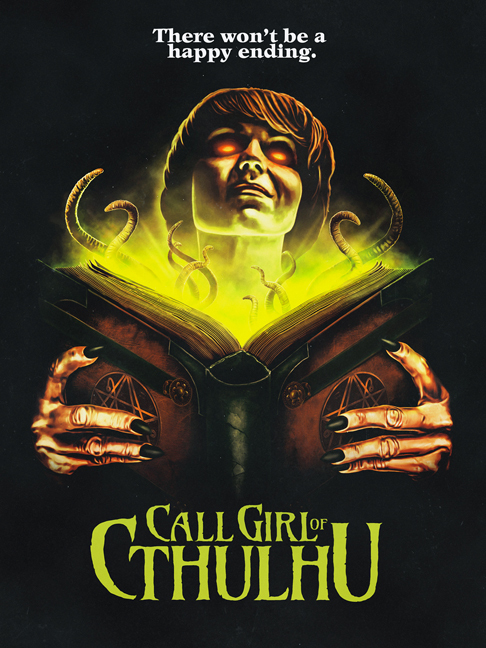 CALL GIRL OF CTHULHU was directed and produced by Baltimore natives Chris LaMartina and Jimmy George in 2014 under their Midnight Crew Studios imprint, also responsible for 2013’s flawless homage to ‘80s Halloween television, WNUF HALLOWEEN SPECIAL. In CALL GIRL, the duo brings the same infectious enthusiasm for the genre they brought to WNUF, while ratcheting up the special FX and gore to deliver one of the most insanely fun and splat-tastic adaptations of H.P. Lovecraft since Stuart Gordon’s RE-ANIMATOR and FROM BEYOND. "This cool flick is witty and packed to the gills with campy effects and lots of good, gory kills"
"low budget goofy fun, better than it should be and quite splattacular"
“An absolute must-see for fans of horror movies, comedies, splatter flicks, and H.P. Lovecraft." "Truly one of the more insanely fun and well-conceived low-budget horror movies I’ve seen all year."